In the high slopes of Sikkim, where difficult terrain, acidic soil and long dry spells make farming an arduous task, buckwheat is grown plentifully along with other traditional crops. The hardy, low-maintenance crop flourishes on poor soil and has a growing season of only 12 weeks. And it grows so thick that it smothers weeds and adds nitrogen and other nutrients to the soil. Despite its name, buckwheat (Fagopyrum esculentum) is not a grain. It is a high-fibre fruit seed that's a good substitute for grains for people who are sensitive to protein gluten in wheat and rice. Diets that contain buckwheat have been linked to lowered blood sugar levels. Buckwheat has also been found to lower blood pressure and reduce cholesterol. The seed's beneficial effects are due in part to its rich supply of flavonoids, especially rutin and magnesium.Magnesium relaxes blood vessels, improving blood flow and nutrient delivery, and lowering blood pressure. Flavonoids are plant-derived nutrients that protect against disease by extending the action of vitamin C and by acting as antioxidants. Buckwheat also contains iron, phosphorous, copper and manganese and is a good source of oil for alpha-linolenic acid, one of the two essential fatty acids our bodies need. Buckwheat features regularly in the diet of the indigenous Lepcha tribe of Sikkim who use not just the seeds in flour form, but also the tender greens as a vegetable (saag). 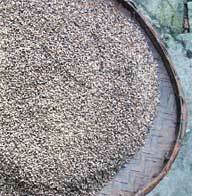 The seeds are also mixed with millet grains and fomented into a traditional brew called chhang. Khuree, an oil-free buckwheat pancake, is a Lepcha speciality traditionally served during festivals like Namsoong (Lepcha New Year) or Tengong-Lorum-Faat (festival of the Himalayas). The pancakes, which have a strong, earthy flavour, are eaten either with a spicy tomato chutney (made with a tart, berry-like local variety) or rolled up with a saag filling. The saag offsets the distinct flavour of the pancakes that might not appeal to all palates. Khuree is typically a home-made dish, not found in restaurants. Even among the Lepchas, it is losing out to sliced bread and noodles. In North Sikkim's Dzongu region, reserved for the Lepchas, only a few elderly women still prepare the dish. Sixty-three-year-old Kacher Lepcha of Dzongu's Pasendang village showed Down To Earth how the pancakes are made. Put the buckwheat flour in a large bowl. 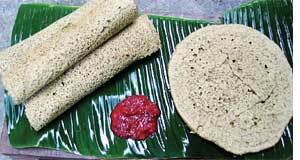 Slowly pour warm water into the flour, stirring constantly until you have a runny, dosa-like batter. Heat a flat girdle. Pour a large serving spoonful of batter on to the girdle and quickly spread it into a large round. When the pancake turns colour (in less than a minute) either turn it over if you have spread the batter too thick or lift it off the girdle. Meanwhile, fry the chopped tomatoes and onions in a little oil. When these soften, add the chopped leaves. Season with salt. Cover and simmer until cooked. Cool before using as pancake filling. For the chutney, simply grind all the ingredients together. Serve the khurees hot, either plain with the tomato chutney or rolled up with the saag filling with the chutney on the side.